The Mecklenburg Declaration was a declaration of independence made by citizens of North Carolina in 1775, a full year before Jefferson penned THE Declaration of Independence. Because the first known reference to the document was in 1819 and no authentic copy of the original has ever been found, it remains highly controversial. 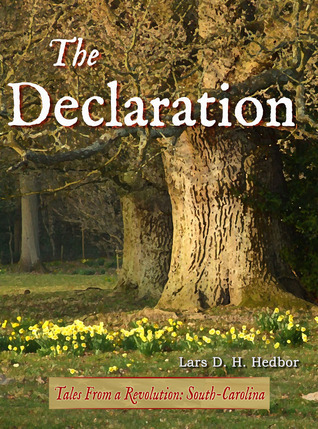 In The Declaration, Mr. Hedbor offers us a fictional account of a present day family finding a broadside of the Mecklenburg Declaration in the attic of their Revolution-era house. But what makes the story so effective is a side-by-side narrative of events taking place two hundred years before. We’re actually able to live the history being discovered in the attic. As ever, Mr. Hedbor’s strength lie in his ability to make the past come alive by giving it a face and a name and a heart. I am especially a fan of the careful vernacular he uses that fits the time period so well. And I love that he chooses to illustrate lesser known corners of the Revolution. I’m a history geek, but the Mecklenburg Declaration was only a hazy name in the back of my mind from a long ago college course. This gave me a new facet of a much-loved era to ruminate about. I confess I read up on it a bit afterward, and Mr. Hedbor’s story rings completely true. Highly recommended. Lars’ books are always good. He combines history and a great story every time. And they’re always clean.